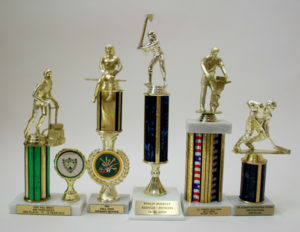 Nowadays, if you or your kids are active in competitions of any kind, the trophies seem to pile up fast. It’s no wonder that SCARCE is frequently asked “Where can I recycle trophies?”. First off, let’s make sure we are all on the same page regarding the recyclability of trophies. Trophies are not recyclable in your home bin. Given the calls we get, it seems that most folks realize this but you might wonder “why?”. 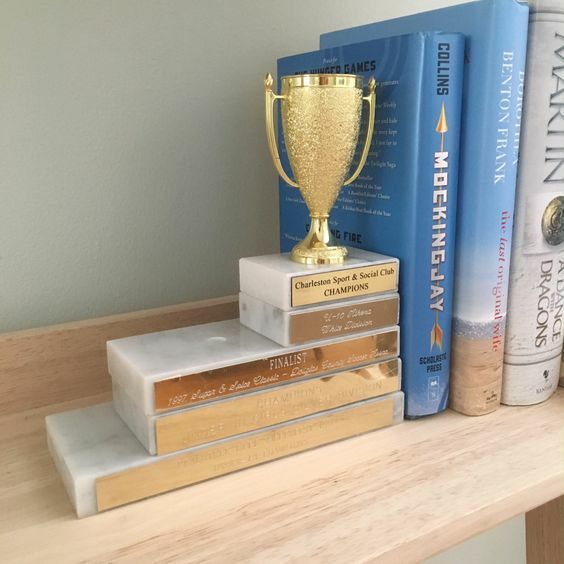 Many trophies are a mix of materials (stone, marble, plastic, metal) that can only be separated by hand – something that simply isn’t done by commercial recycling companies. Whether or not they are a mix of materials, curbside recycling programs are intended for rigid containers from food, beverage, and cleaning supplies – which a trophy is obviously not. Before pursuing one of these options, check with a local trophy store to see if they take back trophies for reuse. If not, there are a few trophy recycling or reuse programs that take shipments or – if you’re lucky to live nearby – drop-offs of trophies and/or medals and plaques for recycling. Shipping is at your own expense. Consider using the UPS carbon neutral shipping service to reduce the impact of your awards. This program charges a $1 fee per trophy. Shipping is at your expense, or you can drop-off at their facility in Madison, WI. They only accept gently used awards – be sure to review their list of non-accepted items. They periodically stop accepting trophies so make sure to check their website before shipping. Non-profit organizations can apply for free recycled trophies. Lamb’s recycling program charges a flat fee of $35 for recycling trophies, medals, and plaques. Shipping is at your own expense and you must email them at recycleawards@gmail.com to get an authorization number and shipping address. If you live in Maryland, there is a drop-off option – email for more info. 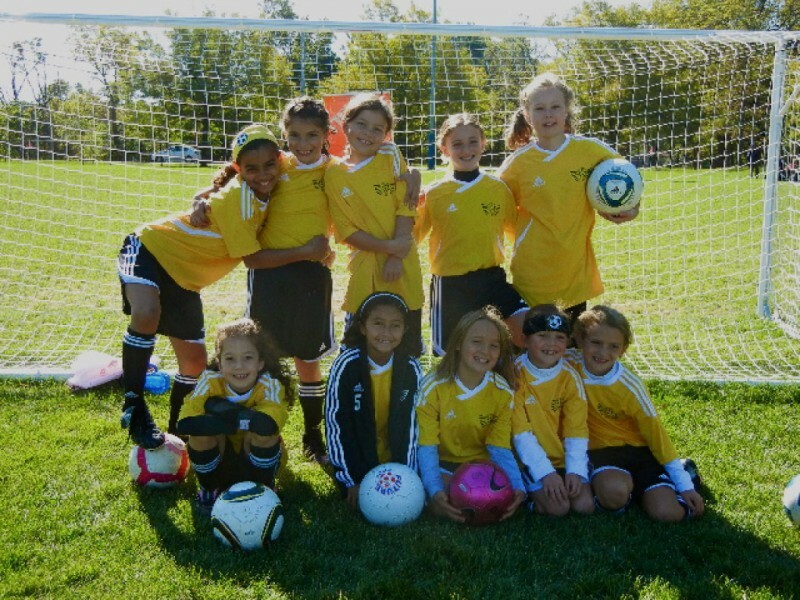 This program takes medals and pins only – no trophies or plaques. The program is free but shipping is at your expense. The organization recycles the medals for funds towards charitable races. They recycle the ribbon via a textile recycling program and also recycle packaging materials (except for packaging peanuts or Styrofoam – which they discourage using). Please note: this organization is not an official not-for-profit but is fully run by volunteers fundraising for charitable events. This program is based in Minneapolis and accepts trophies for reuse. The items are refurbished and unusable parts are recycled. As of this posting, they had not gotten back to our inquiries for more details so please, reach out before shipping. Medals4Mettle accepts medals from marathon, half-marathons/triathalons, and triathalon races only. The medals are then put on their branded ribbons and awarded to children and adults battling illness and trauma. There is no fee but shipping is at your expense. Find a chapter near you for shipping and fill out their donation form. Given that shipping may cost an arm and a leg you could try re-purposing your old trophies. A quick google search will yield some creative options, like DIY cake stands, book ends, or a coat rack. If you’re not creatively inclined, you could try posting in a Facebook group such as Buy Nothing, on Craigslist, or on Freecycle. Limited quantities of trophies can also be donated to The Wasteshed in Chicago. In the very least, if any part of the trophy or award is made of metal, those parts can be removed and recycled at a scrap metal recycling facility. If you or your kids are involved in programs that award trophies or medals to participants, consider advocating for a less resource-intensive (and hard-to-recycle) option. The money that would otherwise be budgeted for trophies, could instead be used towards either one of these options. Consider an end-of-season team celebration instead, like a pizza party (of course, with reusable dishes since the goal is to cut down on waste). The fun memory will last longer than a trophy and won’t gather dust on a shelf. If you want something to give out, consider a paper certificate and perhaps a team photo printed on matte paper (photo paper is not recyclable). The coach could come up with a superlative for each team member if they want to highlight individual contributions or achievements. It’s a nice memory, provides recognition and can easily be recycled if or when it’s no longer wanted. If skipping trophies isn’t an option (yet…) try purchasing refurbished trophies from one of the recyclers listed above or trophies made from recycled materials. This company will make new engraved nameplates if you want to update an old trophy or make your own.